December 2010 - Minerd.com founder Mark Miner (named "Minerd") is mentioned in the book, A Place Called Hexie, a "novel interspersed with historical facts," authored by Samuel Miller, seen here. (Bloomington, IN: AuthorHouse). Primarily focusing on the Hexebarger section of Kingwood, Somerset County, PA, Miller writes: "... there is a fellow ... by the name of Mark Minerd, who is an authority on the family." Miller's brother, the late Clyde B. Miller, published Minerd-Miner genealogical material in the 1990s in his newsletter, The Hexie Gazette, and all four editions of the newsletter are preserved in our family archives. More about the book and how to order. 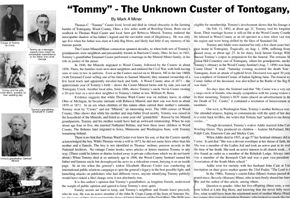 August 2010 - The Little Big Horn Associates' Newsletter for August features a Minerd.com cover story headlined "Tommy: The Unknown Custer of Tontogany, Ohio." The cover artwork features Minerd.com photographs of a Sons of Veterans parade and colorful logo. In the inside center spread, the article covers our family's unique Custer connection from the perspective of cousin Thomas C. "Tommy" Custer, the illegitimate son of Capt. Thomas Ward Custer and Rebecca Minerd. The two-page layout also contains more than 15 of Minerd.com's archival photographs and documents. July 27, 2010 - The news of Minerd.com's promotional joint venture with VisitPittsburgh.com is syndicated nationally via PR Newswire, and is picked up by more than 300 leading electronic news media outlets, blogs and databases, including CNBC, Yahoo!, Hispanic Trend, Entrepreneur.com, BizJournals.com and more. View the news release. May 2010 - A department of history honors thesis, authored by Ohio State University student Alexandra Finley, references Minerd.com as a major source for her research of the family of William Minerd. Entitled "Founding Chestnut Ridge: the Origins of Central West Virginia's Multiracial Community," the thesis discusses "the nature of racial ambiguity and identity construction in an early American frontier settlement." Link to the paper -- a work in progress which should not be re-distributed without permission of the author, who is working on her doctorate at the College of William and Mary. April 18, 2010 - At a meeting of the Sons and Daughters of Union Veterans in Somerset County, PA, at the historic Mount Union Church near Rockwood, Minerd.com founder Mark Miner presents "Innocent Farm Boys No More: Somerset County Minerd-Miner Cousins in the Civil War." The illustrated powerpoint talk highlights the wartime and life stories of David Harbaugh, Henry A. Miner, Jacob M. Younkin, Charles Rose, Richard M. Gorsuch and Ephraim Minerd, and describes Miner's own personal brush with history when meeting a Civil War soldier's daughter in 1978. There's no place like Pittsburgh and its countryside when it comes to family reunions. Aunt Mary and Uncle Tom will love Pittsburgh as much as Grandma Betty. Reunions are a perfect way for families to experience Pittsburgh's transformation into America's Most Livable City. Just as the Minerd-Miner-Minor family. 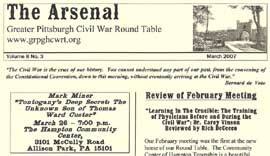 (www.minerd.com) The clan first began holding annual reunions in Western Pennsylvania in 1913. Cousins travel here from many states, including as far away as California. Feb. 10, 2010 - Minerd.com and its sprawling storytelling of its thousands of cousins is featured in the "Share Your Story" section of the PBS website promoting the "Faces of America" series with Harvard scholar Henry Louis Gates, Jr. The series, which began airing Feb. 10, explores the personal "family histories of 12 renowned Americans -- professor and poet Elizabeth Alexander, chef Mario Batali, comedian Stephen Colbert, novelist Louise Erdrich, journalist Malcolm Gladwell, actress Eva Longoria, musician Yo-Yo Ma, director Mike Nichols, Her Majesty Queen Noor, television host/heart surgeon Dr. Mehmet Oz, actress Meryl Streep and figure skater Kristi Yamaguchi." Details (scroll to Feb. 10 entry). Sept. 28, 2009 - In its article "Tips for Making a Good Web Site," Family Tree Magazine again ranks Minerd.com among the nation's "10 personal genealogy Web sites" that "are the cream of the crop." Says the magazine, "Take some time to visit them. They might inspire you to clean up your existing family history site, or to put your own fascinating family story online. Full text. July 30, 2009 - In his new book released today, Life Is a Jukebox: Real Stories of Triumphs and Tragedies, and produced by Trafford Publishing, author Richard Dean "Rick" Minerd highlights Minerd.com and writes: "My own heritage, that is, the Minerd family migrated this way from [Southwestern Pennsylvania]. A website authored and managed by a 'distant cousin', Mark Miner, called Minerd.com details some amazing historical facts about that side of my extended family." Rick is a retired chief of police in Obetz, a suburb of Columbus, Franklin County, OH, and spent more than two decades in local law enforcement, after spending many years as a radio news, sports and talk-show broadcaster in Columbus. Summer 2009 - The Dunbar (PA) Historical Society's new book, Dunbar: Images of America, quotes from the Minerd.com biography of Allen Edward Harbaugh. In the book's bibliography, Minerd.com's founder is named as the author of an early version of the Harbaugh biography, as published in the Fall 1999 edition of Western Pennsylvania History Magazine of the Historical Society of Western Pennsylvania, and entitled ""Al-Ed-Ha: Fayette County's Forgotten 'Mountain Poet'." March 2009 - The Winter 2009 edition of the Battlefield Dispatch newsletter of the Custer Battlefield Historical & Museum Associates, Inc., publishes a short article about last summer's Ohio Historical Society dedication of the Custer Homestead memorial marker in Tontogany, OH. The article mentions the role Minerd.com founder Mark Miner played in the dedication ceremony and also helping to raise funds for the effort. For more on the dedication, see our "In the News" entry for Aug. 10, 2008. 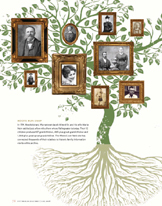 March 24, 2009 - A post by Diane Haddad on her Genealogy Insider blog of Family Tree Magazine, "Tips from a Reunion Whiz," analyzes our "Pittsburgh 250" family reunion and identifies four highlights for readers to "steal some inspiration for your own gatherings." They include: 1.) Enlarge your invite list; 2.) Consider sponsorship; 3.) Visit a historical site; and 4.) Incorporate family history. Full text link. 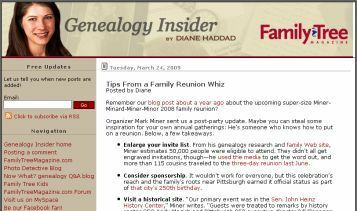 Genealogy Insider's Diane Haddad analyzes last year's "Pittsburgh 250" reunion on her March 24, 2009 blog posting, "Tips from a Family Reunion Whiz." Click for full text. 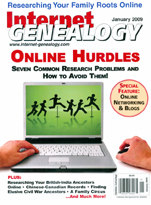 December 2008 - The December 2008/January 2009 issue of Internet Genealogy magazine features a full page profile Minerd.com and its founder, headlined "Bringing Family Together - Donna Murray Finds Out What Makes Minerd.com a Top Family Website." The specialty magazine has a national circulation and is available on newsstands coast to coast. Donna writes that the "highly regarded" site is a "way to share material and pull distant cousins out of the woodwork... It's easy to navigate, well-organized and it's free. The biographies form the core of the site and the rest of the data flows from this central concept." She adds that the site's goals include "becoming a veritable People Magazine for Minerd descendants ... and to help genealogy achieve a more mainstream status in our culture." Donna previously wrote about our site in 2002 for the St. Petersburg (FL) Times, headlined "Family Web Sites Help You Find the Past in Cyberspace," praising Minerd.com as a model for others to follow, and calling it "informative, educational and interesting." 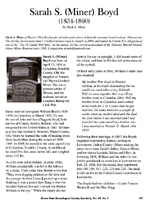 Fall 2008 - The Minerd.com biography of Sarah (Miner) Boyd, wife of Civil War veteran William Boyd of Fulton County, IL, is republished in full in the Fall 2008 edition of the Illinois State Genealogical Society Bulletin (Volume 40: Number 3). Nov. 16, 2008 - In the "Focus Magazine" of the Pittsburgh Tribune-Review, a postcard from our archives is published showing Lafayette and Benjamin Franklin Junior High Schools in Uniontown, Fayette County, PA. The card originally was printed by the Columbus Heating & Ventilating Co. of Pittsburgh and Columbus, OH to promote the installation of its products in the schools, both built in 1925. The image may be seen in our "Sense of Wonder" feature page honoring hundreds of public educators in our extended family. Nov. 12, 2008 - The Butler (PA) Civil War Round Table hosts Minerd.com founder Mark Miner for his popular talk, "The Custer Family's Deep Secret," telling the story of General George Armstrong Custer's nephew, Thomas C. Custer. The event is held at the Butler YMCA. Oct. 21, 2008 - Minerd.com's founder Mark Miner reprises his powerpoint presentation on his "The Custer Family's Deep Secret" at the Civil War Round Table of Erie, PA, telling the story of General George Armstrong Custer's nephew, Thomas C. Custer. The event was held at McDowell Intermediate School. 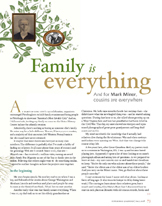 Fall 2008 - In its special commemorative "Pittsburgh 250" edition, Pittsburgh Quarterly magazine publishes "Family Is Everything -- and for Mark Miner, Cousins Are Everywhere," authored by Minerd.com founder Mark A. Miner. The article highlights our award-winning Minerd.com website and how it is contributing to the Pittsburgh 250 initiative. Pictured in an attractive layout are cousins and "significant others" of the past -- Allen E. Harbaugh, William Curtis McKnight, Thomas Ward Custer, Annette Hanshaw, Rebecca Minerd, Christian and Esther (Barnhouse) Freed, Henry Yutzy, Harvey "Dean" Miner, Corwin Tilbury, Seth Reed Johnston and Virginia (Riley) Snyder. In promoting the article, magazine publisher Doug Heuck calls ours' the "biggest family in town and says our "reunion could fill Heinz Field." In an online preview (under "People"), the magazine says our story "is a familiar one in Pittsburgh of ample family nearby and roots running deep into the 18th century." The magazine bills itself as a forum "where commerce and culture meet." Click for a PDF reprint (1MB in size). Oct. 5, 2008 - The Pittsburgh Tribune-Review's Focus Magazine prints a postcard from our archives showing the fan house at the coal mining complex at Republic, Fayette County. Republic was at the center of the Pittsburgh region's early labor movement, and organizers from the town met with President Franklin D. Roosevelt in 1933 to settle a crippling coal strike. The image may be seen in the Minerd.com biographies of Wilbert "Patsy" Minerd, Flora [Minerd] Mills, Minnie [Minerd] McKnight, Marcellus Murray and on our "Coal, Coke and Steel" feature page. August 2008 - Minerd.com founder Mark Miner is pictured and featured in the Little Big Horn Associates Newsletter (Vol. XLII, No. 7) for his role in speaking at the dedication of -- and helping to raise funds for -- the Ohio Historical Society's "Custer Homestead" marker in Tontogany, Ohio. Click for a reprint of the one-page article. Aug. 10, 2008 - Minerd.com founder Mark A. 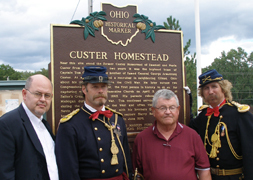 Miner joins state and local dignitaries to formally dedicate a bronze Ohio Historical Society marker honoring the "Custer Homestead" in ceremonies in Tontogany, Wood County, on Sun., Aug. 10. The plaque memorializes the family of General George Armstrong Custer and his family during their little-known years of residence in Tontogany during the Civil War. The event was held as part of the 2008 Tontogany Festival at the new Otsego High School Auditorium and Performing Arts Center. At the dedication, Miner reprises his powerpoint talk on "Tontogany's Deep Secret" featuring the story of Thomas Ward Custer, Rebecca Minerd and their child born out of wedlock, Thomas C. "Tommy" Custer. Click for details. Aug. 3, 2008 - A postcard from our archives dated 1907 is published in the "Focus Magazine" of the Pittsburgh Tribune-Review, showing coke ovens at the coal mining patch town of Leckrone near Uniontown, Fayette County, PA.
July 25-26, 2008 - Minerd.com and its founder Mark Miner are mentioned in the Uniontown (PA) Herald-Standard and Somerset (PA) Daily American in connection with Miner's role as publisher of the specially reprinted booklet, the Younkin Family News Bulletin, 1937-1941, The high quality, tabloid-size publication is unveiled and distributed at the national Younkin Reunion in Somerset County, PA. The booklet contains high quality copies of all 44 pages from the eight original family newspapers, published by Charles Arthur Younkin during the Great Depression and leading up to the summer before World War II. The booklet also features copies of original invitations and newspaper clippings from the National Younkin Home Coming Reunions from 1934 to 1941. Plans are to distribute copies to public libraries and historical societies throughout Western Pennsylvania. Each page is professionally scanned from originals found in cousins’ collections all over the U.S., with an attractive cover and high quality paper and binding. Only 100 copies are being printed. The low sales price of $20 is made possible through underwriting by several generous Younkin cousins. July 8, 2008 - In a posting entitled "Indian Reservation," cousin-blogger Rick Minerd promotes Minerd.com's role in the upcoming dedication of the Custer Homestead monument in Tontogany, OH. Rick has featured Minerd.com before in his "I'm Just Rick" blog and calls our website "a complete history book in and of itself." 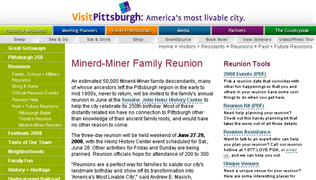 June 27-29, 2008 - The Minerd-Minard-Miner-Minor family's annual national reunion in Pittsburgh, to help the city celebrate its 250th birthday, is covered with feature stories in the Pittsburgh Post-Gazette and Pittsburgh Tribune-Review, and a segment on the KDKA-TV evening news. 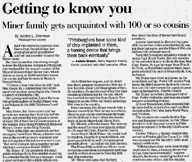 The Post-Gazette article is headlined "Getting to Know You," and the Tribune-Review's is "Clan's Reunion to Draw from Across the Country." Both of Pittsburgh's major daily newspapers ran stories about our 2008 reunion -- at left: Pittsburgh Tribune-Review ("Clan's Reunion to Draw from Across the Country"); right: Pittsburgh Post-Gazette ("Getting to Know You"). 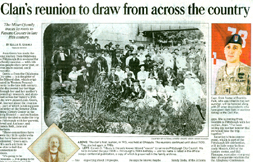 June 21, 2008 - The Connellsville (PA) Daily Courier publishes "Minerd-Miner Reunion" about our clan's upcoming Pittsburgh 250 family reunion. The Courier says that Minerd.com "is built upon a quarter century of extensive genealogy research of several thousand branches which descend from a Pennsylvania German couple who settled near Mill Run in 1791." April 27, 2008 - A postcard from our archives dated 1911 is published in the "Focus Magazine" of the Pittsburgh Tribune-Review, showing West Main Street in Addison, Somerset County, which was a toll stop along the National Turnpike, our nation's first super highway, in the 1800s. April 16, 2008 - The VisitPittsburgh.com press release with the invitation to our reunion is published on the TravelersJournal.com website. 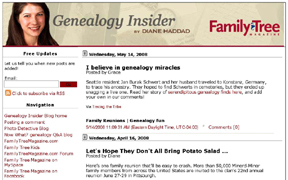 April 16, 2008 - The "Genealogy Insider" blog of Family Tree Magazine, authored by Diane Haddad, publishes a preview of our upcoming Pittsburgh 250 reunion, entitled "Let's Hope They All Don't Bring Potato Salad." Haddad writes: "My favorite part [of Minerd.com], Connectedness, takes a look at Minerds who ran in the Oklahoma 1889 land rush, fought in wars, worked (and died) in steel mills, served on Pittsburgh's city council and more. Check it out, especially if you're planning to crash the reunion -- you'll have to blend in somehow." March 30, 2008 - In its Sunday "Focus Magazine," the Pittsburgh Tribune-Review republishes a postcard from our archives, showing a color-tinted bird's-eye view of Dawson, Fayette County, PA. The card originally was published in the Sept. 2, 2007 issue of "Focus." 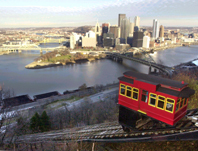 March 2008 - To promote Western Pennsylvania as the ancestral home of tens of thousands of extended cousins in our clan, Minerd.com and our national reunion have been profiled on VisitPittsburgh.com, the website of the Greater Pittsburgh Convention and Visitors Bureau. We also are granted permission to use VisitPittsburgh's distinctive orange and purple logo. Dec. 16, 2007 - A postcard from our archives, dated 1913, is published in the "Focus Magazine" of the Pittsburgh Tribune-Review, showing muddy Morgantown Street in Fairchance, Fayette County, PA. The image may be seen in the Minerd.com biography of Margaret (Hoye) McClain. Nov. 4, 2007 - An undated postcard from our archives is published in the "Focus Magazine" of the Pittsburgh Tribune-Review, showing an unpaved street and utility poles on South Commercial Street in Ohiopyle, Fayette County, PA in the early 1900s. The image may be seen in the Minerd.com biography of Mary (Leonard) Potter. Sept. 2, 2007 - With the Youghiogheny River shown in the foreground, a color-tinted postcard from our archives, showing a bird's-eye view of Dawson, Fayette County, is published in the "Focus Magazine" of the Pittsburgh Tribune-Review. Aug. 5, 2007 - Undated postcard from our archives shows the arch built to mark Connellsville's centennial in 1906, and is published in the Pittsburgh Tribune-Review. Made entirely of coke, an industrial fuel, the arch was created by the H.C. Frick Co. The image may be seen in the Minerd.com biographies of Jennie (Miner) Turner Paolone Stevenson and Mallzena (Younkin) Shaffer). July 28, 2007 - At the annual national Younkin Family Reunion, Minerd.com founder Mark Miner gives a powerpoint presentation on "Charleroi Charley, Masontown Otto and the Great Younkin Awakening of the 1930s." The talk focuses on the pioneering, exhaustive Younkin research, newspaper publishing and reunion organizing efforts of Charles Arthur Younkin and Otto Roosevelt Younkin in Western Pennsylvania during the Great Depression, and the legacy of their efforts today through the exhaustive work of the late Donna (Younkin) Logan of the 1990s and early 2000s. Plans are announced to republish all eight original issues of the Younkin Family News Bulletin newspaper from 1937-1941, in an attractive cover to deposit in libraries all throughout Western Pennsylvania. As well, a volunteer team is formed to begin scanning the voluminous, thick three-ring binders of genealogy papers compiled by Logan during the years of her research, so that the data can be widely and freely distributed for use by generations of Younkin cousins in the future. 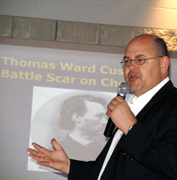 July 21, 2007 - Minerd.com's founder Mark Miner presents a powerpoint talk at the annual national conference of the Little Big Horn Associates in North Platte, Nebraska, on his award-winning topic, "Tontogany's Deep Secret: The Unknown Son of Thomas Ward Custer." The event, telling the story of Thomas C. Custer and his mother Rebecca Minerd, is set against the backdrop of the national persona of General George Armstrong Custer. Miner also is mentioned in the July 2007 edition of the Little Big Horn Associates Newsletter. July 8, 2007 - Postcard from our archives depicts pedestrians watching as a horse-drawn carriage pauses on a commercial block in Waynesburg, Greene County, in an image postmarked 1915, and showing the People's National Bank and other businesses, is published in the Pittsburgh Tribune-Review. The image may be seen in the Minerd.com biography of Clinton Theodore Farabee. June 2007 - Minerd.com publisher Mark Miner is mentioned in the bibliography of a new book, Beleaguered Winchester, authored by Richard R. Duncan and issued by the Louisiana State University Press. The citation is in reference to Miner's article, "First Fight, First Blood," published in 1989 in the Journal of the Winchester- Frederick County (VA) Historical Society, and describing the role of the 12th West Virginia Infantry during the Civil War's Second Battle of Winchester. 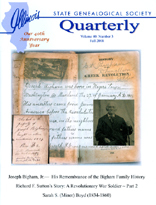 The article also discusses battle activity of the 123rd Ohio Infantry, in which William J. Burditt served as a private. June 10, 2007 - A postcard from our archives, dated 1921 and showing the U.S. Pipe Mill in Scottdale, billed as the "largest in the world," is published in the Pittsburgh Tribune-Review. The image may be seen in the Minerd.com biography of Howard Campbell Miner and Marcellus Murray. May 22, 2007 - Because of its unique role in promoting Western Pennsylvania by educating cousins that their ancient roots are based here, Minerd.com and our national reunion have been licensed to use the logo of "Pittsburgh 250." This exciting development shows our commitment to assist in the celebration of the Pittsburgh region's upcoming 250th birthday in 2008, a widespread initiative led by the Allegheny Conference on Community Development. This is the second time our website has been authorized to use an official logo to promote a region's historical anniversary, with the first time in 2003 featuring the logo of the Ohio Bicentennial Commission for our "Ohio Bicentennial Page" honoring the Buckeye State's 200th birthday. May 15, 2007 - Minerd.com is reviewed on the I'm Just Rick" blog of Rick Minerd (AOL Journal). Entitled "Minerd.com," the piece reads, in part: "The Minerd's I grew up knowing of a connection with were all in Southern Ohio. The bad news for those who don't like us is that there are Minerds in every nook and cranny of the planet. Something like a quarter of a million are related in one way or another. Maybe it's a million." Seen here, Rick is the great-grandson of Jacob and Martha (Buck) Minerd Jr. of Athens County, Ohio. May 2007 - Minerd.com founder Mark Miner is named in the May 2007 issue of the Little Big Horn Associates Newsletter, as one of the speakers for the LBHA's annual national conference, to be held July 21, 2007, in Nebraska. April 29, 2007 - An undated postcard from our archives, showing a bird's eye view of Carnegie Steel Company's Homestead Works, comprising open hearth plants No. 3 and No. 4, structural mills, sheared plate mills, the armor plate department and electric powerhouse, is published in the Pittsburgh Tribune-Review. The image may be seen in the Minerd.com biographies of Jennie (Miner) Paolone and Ida Ellen (Farabee) Taylor. March 26, 2007 - Minerd.com founder Mark Miner is the featured speaker before about 75 members of the Greater Pittsburgh Civil War Round Table on "Tontogany's Deep Secret: The Unknown Son of Thomas Ward Custer." Held at the Hampton Community Center in Allison Park, the talk is based on his award-winning article in the Research Review Magazine of the Little Big Horn Associates, first published on this website, and is previewed in the Round Table's monthly newsletter, The Arsenal. In a newsletter commentary published in April, reviewer Rich DeCecco said the topic was "interesting" and that the talk included "a very professional looking power point presentation." March 25, 2007 - A postcard from our archives, showing Sewickley Valley Hospital, on Blackburn Road, today part of the Heritage Valley Health System, is published in the Pittsburgh Tribune-Review. The image may be seen in the Minerd.com biography of Jennie (Miner) Paolone. Feb. 11, 2007 - A postcard from our archives, mailed in 1912, showing a streetcar making its way toward downtown Greensburg, Westmoreland County, PA, is published in the Pittsburgh Tribune-Review. The image may be seen in the Minerd.com biographies of Pearl (Beggs) Altman and Viola (Younkin) Mountain. Dec. 31, 2006 - An undated postcard from our archives, of the United Brethren Church of Youngwood, Westmoreland County, PA, is published in the Pittsburgh Tribune-Review. The image may be seen in the Minerd.com biography of Claude C. Overholt. Nov. 12, 2006 - A postcard from our archives, postmarked 1914, showing the rooftops of Wilkinsburg, near Pittsburgh, is published in the Pittsburgh Tribune-Review. The image may be seen in the Minerd.com biography of Eli Leonard. Oct. 8, 2006 - A postcard from our archives, mailed in 1911, depicting the stone walls and towers of the Western Pennsylvania Penitentiary on Pittsburgh's North Side, is published in the Pittsburgh Tribune-Review. The image may be seen in the Minerd.com biography of Martha (Minerd) Gorsuch. 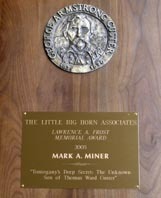 September 2006 - The Newsletter of the Little Big Horn Associates carries a photograph of Minerd.com founder Mark A. Miner on the back cover, "Faces of the Richmond Conference," seen accepting the Lawrence A. Frost Memorial Award for authorship of "Tontogany's Deep Secret: The Unknown Son of Thomas Ward Custer." The article was adapted from material first published on Minerd.com. Aug. 27, 2006 - A postcard from our archives, postmarked 1913, is published in the Pittsburgh Tribune-Review, showing the National Tube Company's works and furnaces in Pittsburgh. The image may be seen in the Minerd.com biographies of Rachel (Long) Pritts, Della (Firestone) Hilling, Ida (Murray) Ritenour and Harriet (Younkin) Romesburg Turney. July 29, 2006 - The article about a forgotten Ohio oilfield worker, first told on Minerd.com, wins an award for the best article published in a magazine dedicated to the legacy of Gen. George Armstrong Custer. Author Mark A. Miner, founder of Minerd.com, accepts the Lawrence A. Frost Memorial Award for "Tontogany's Deep Secret" at the annual conference of the Little Big Horn Associates in Richmond, VA. 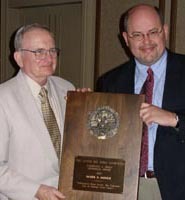 He is seen here with John S. Manion, chairman of the LBHA editorial review board. The article appeared in the Summer 2005 edition of the LBHA's magazine, Research Review. The LBHA is a 900-member organization devoted to research, publications and conferences about Gen. Custer, the battle and his family. The article specifically features the obscured life of Thomas C. Custer, who was born out of wedlock to Gen. Custer's brother, Capt. Thomas Ward Custer, and Rebecca Minerd, who were neighbors on farms in Tontogany, near Bowling Green, OH. Through rare documents, photographs, newspaper articles and court records, Miner not only delves into the Custer family's years of residence in the sleepy Ohio town during the Civil War, but gives insights into the 19th century handling of illegitimate children, and the degree to which the boy's story was kept quiet. The award is named in memory of Dr. Frost, a nationally recognized authority who was longtime curator of the Custer collection in the Monroe County Museum in Michigan. July 23, 2006 - A postcard from our archives, postmarked 1944, is published in the Pittsburgh Tribune-Review. It shows an automobile on Scullton Road (now known as Route 653 or Springfield Pike), leaving Normalville in Fayette County, with the "Little Alps of America" as a backdrop. The image may be seen in the Minerd.com biographies of Iva (Conn) Henry, William Jacob Long, Bessie (Enos) Weimer and John Walter Miner, all of different branches of the family who lived in the Normalville/Scullton areas. June 4, 2006 - An undated postcard from our archives, showing the railroad junction in Brownsville, Fayette County, PA, is published in the "Focus" Magazine of the Pittsburgh Tribune-Review. The image may be seen in the Minerd.com biography of Thomas Springer McKnight. April 23, 2006 - A postcard from our archives, postmarked 1914 and showing the popular West View Park in Pittsburgh, is published in the "Focus" Magazine of the Pittsburgh Tribune-Review. The image may be seen in the Minerd.com biography of Mentzer Tilbury. April 6, 2006 - Before several hundred VIPs at a meeting of the Pittsburgh 250 Commission, an initiative of the Allegheny Conference on Community Development, Minerd.com is praised for its creativity and innovation by Andrew Masich, CEO of the Senator John Heinz Pittsburgh Regional History Center, and founding member of the Commission. March 12, 2006 - A postcard from our archives, postmarked 1908 and showing Main Street looking east in Connellsville, Fayette County, is published in the "Focus" Magazine of the Pittsburgh Tribune-Review. The image may be seen in the Minerd.com biography of Warren Dempsey Younkin Sr.
Feb. 5, 2006 - A postcard from our archives, postmarked 1915 and showing a bird's eye view of South Burgettstown, Washington County, PA, is published in the "Focus" Magazine of the Pittsburgh Tribune-Review. The image may be seen in the Minerd.com biography of Ida Catherine (Firestone) Langenheim. Jan. 1, 2006 - A postcard from our archives, showing the Indian Creek Reservoir between Normalville and Mill Run, Fayette County, PA, is published in the "Focus" Magazine of the Pittsburgh Tribune-Review. The image may be seen in the Minerd.com biography of Jonas Rowan.